Cuban-seed leaves from Nicaragua and the D.R. 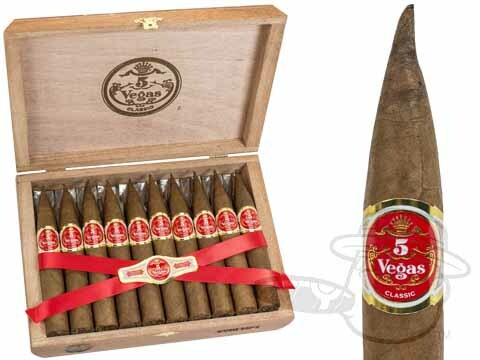 under a dark and oily Sumatra wrapper explode with rich and creamy flavor in the 5 Vegas Classic cigar. Medium in body with layered tasting notes of smooth earth, roasted nuts, coffee bean, and subtle spice, the aptly-named 5 Vegas Classic is an awesome “anytime” smoke with timeless taste.